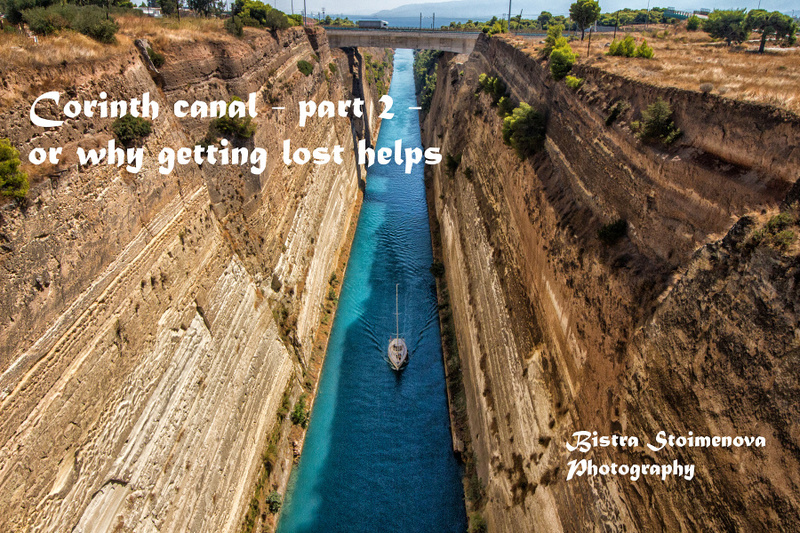 BistraStoimenovaPhotography: Corinth Canal - part 2 - or why getting lost helps? 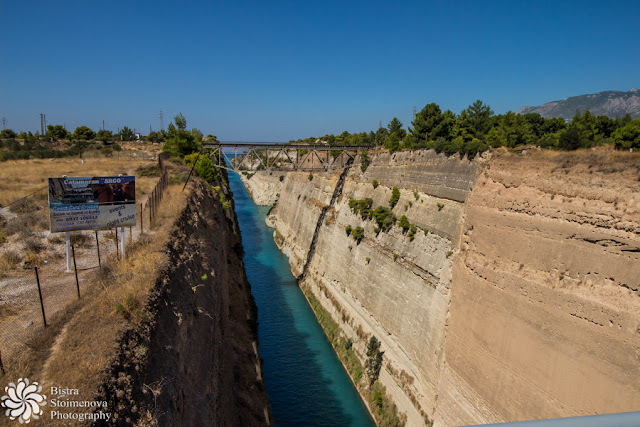 Corinth Canal - part 2 - or why getting lost helps? 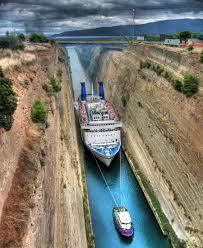 I've always wanted to take a picture of Corinth Canal with a boat inside it - you know, like the iconic picture below. If you have read the previous post, you already know what happened on day 1 and you probably know that I was dead-set on getting things right today. This part of the story starts in the morning at the hotel reception. Totally into the idea of getting a shot like the one above, I went to ask about ships. After all, they should know, right? The guy at the reception was very helpful but I doubt he understood much of what I had in mind told me that tourist boats go inside the canal but big ships are few and far between. Still, I was determined to go there and take my iconic shots. 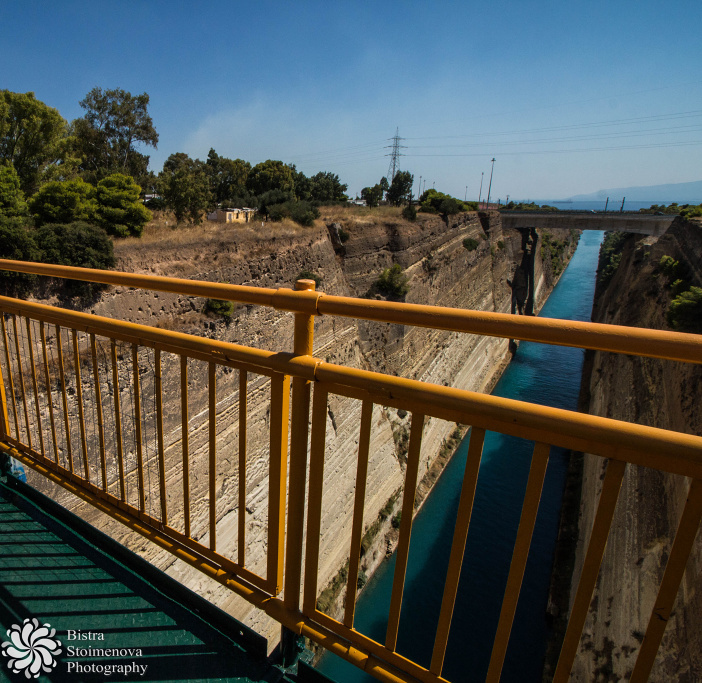 In the morning we went to Mycenae (which is the topic of another post) and at 11 am we drove back to Corinth - the distance is roughly 60 km. There was a road sign on the highway but from Peloponnese there was none. So we got a panoramic view of Corinth and its streets. And the oil refinery. If you book a hotel - check where it is on the map because there is a very high chance of being close to the refinery. And that is HUGE! If the hotel is close - you will enjoy the smell of petrol derivatives 24/7. 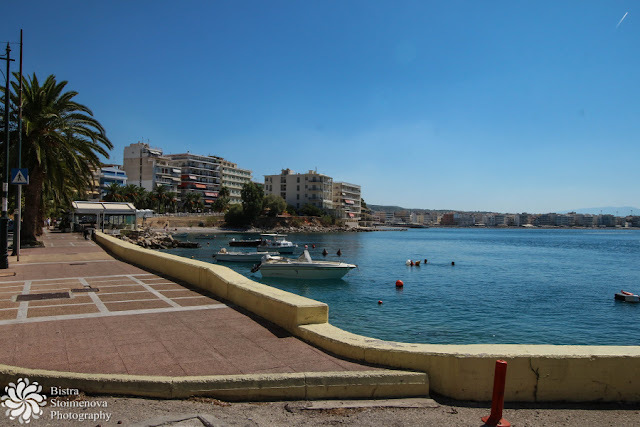 Corinth is a really nice town with plenty of things to see for it's size and no doubt - amazing accommodation and taverns - but the smell of petrol is not one of my favourites. Luckily we checked that BEFORE we went there. 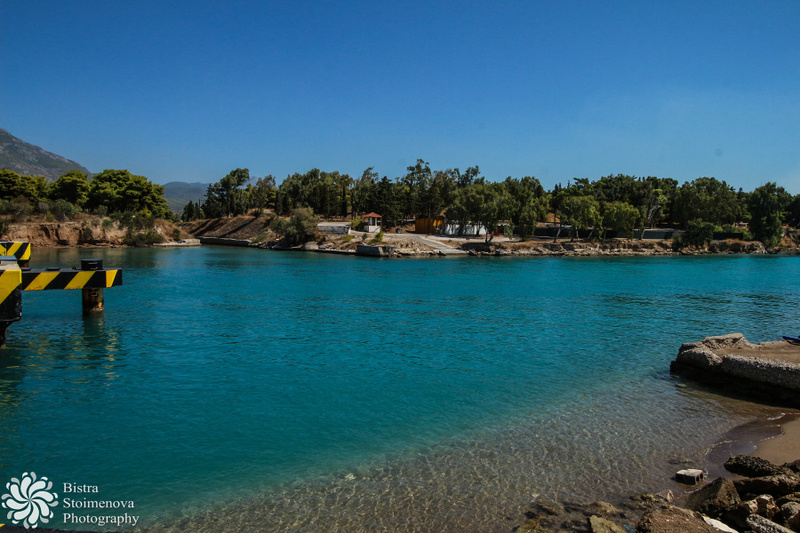 One of the beaches of Corinth that I managed to shoot along the way. We went in and out of Corinth several times during some of which we came close to the channel. 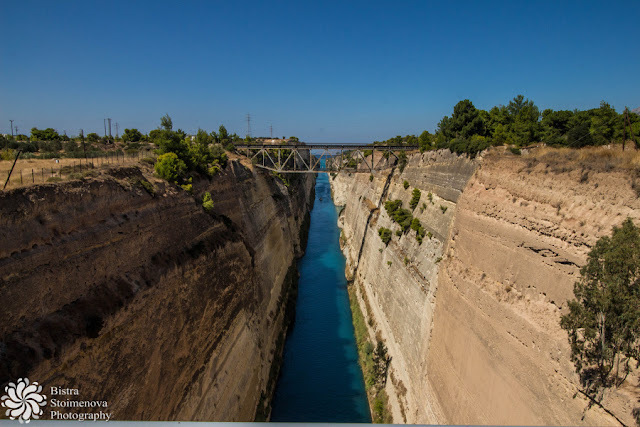 Twice we went over a submersible bridge at one end of the canal and we kept driving along one of its sides. You can see it's there but you cannot reach it. You see where it is but you don't see where to turn for the viewpoint. Time went on and the sun went down - and I got nervous. Meanwhile we kept circling the streets of Corinth. 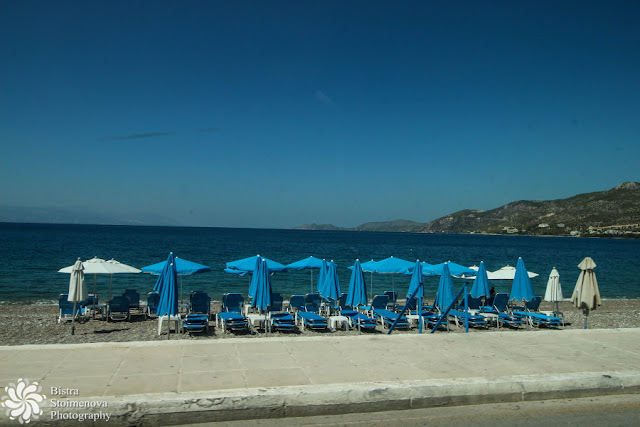 After all, we had only two days in that part of Peloponnese and it was already day 2! Bearing in mind that the pictures from yesterday I can happily delete at any instant because they show nothing of the canal that I wanted to capture. (you can see the previous post to get the impression of how bad things were). The view from the submersible bridge - again! 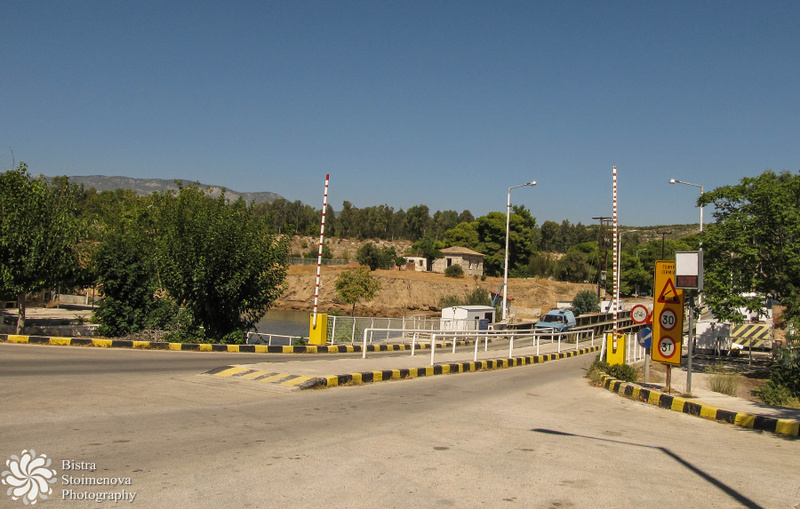 After a few zig-zags in and out of Corinth - AGAIN! - we got to the viewpoint. Time: 12.30. Not too late, I hoped. I got out of the car and started running - at 30 degrees plus Celsius - and started frantically taking pictures of practically everything I got my lens on. Thank God I got the wide angle lens!!! Time went on and I got to the other side of the bridge (remember what I told you about the viewing platform being nonfunctional). 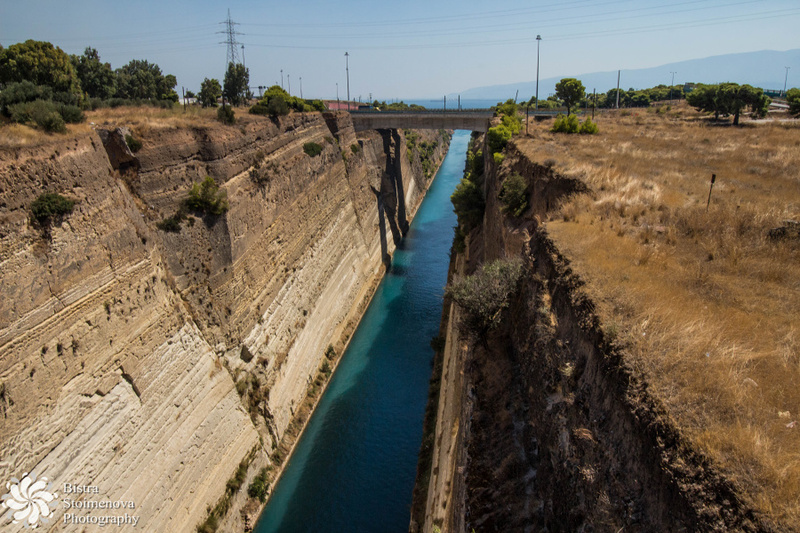 This is the iconic view of the canal. Shot from the pavement of the car - bridge. Basically hanging on the safety fence for the shots of that side of the canal because the viewing platform was closed. By the time I was done with preliminary shots, it was around 1 pm. Guess what??? 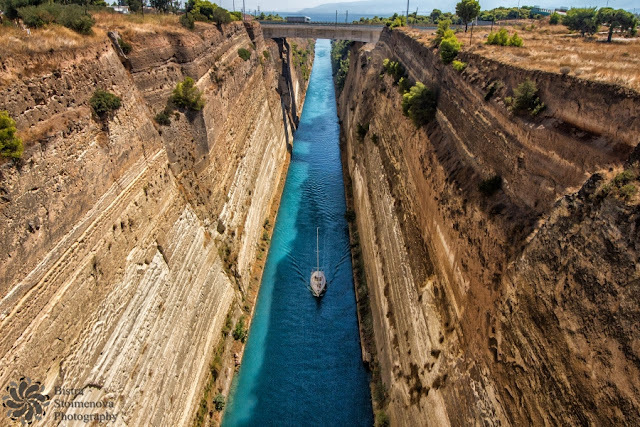 At the far end of the canal I saw a boat approaching! A BOAT! No matter the time, I was totally into waiting for the boat to come to me - and even to get out of the canal. It was the picture-postcard thing I wanted to do!!! So I waited - it turned out that I didn't have to wait for a long time - some 15 minutes. It was a miracle! My dream came true (well - sort of - it was a big ship but this little boat was ideal to show ho big th channel is). So I started snapping as if I had a machine gun - click, click, click, chat, chat, chat, chat! I LOVED IT!!! I was glad we got lost, after all - because otherwise we would have gotten to the canal earlier and we wouldn't have seen the boat. Now, the technical information: how to get a picture like that? There are several tourist boats that get inside the canal - either to show it to the tourists or just for the fun of being photographed from above (the people in the boat were having a great time while I was taking those shots). 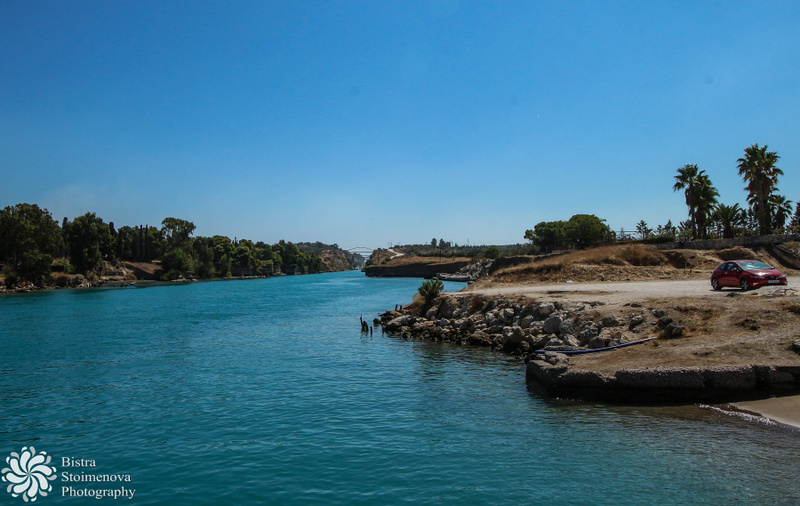 The boats have different schedule - so make sure you check it out first before you get on location. I think that there is at least one of them that gets inside the channel at midday - which means - somewhere between 12.00 and 13.00 pm and I think that there is another one later on during the day. Make sure to be on location at midday - when the sun falls directly from above and the water inside the channel looks azure. Trust me, you won't regret it. If it is cloudy - any time would be suitable. But the water is less likely to be azure. It is generally HOT in Peloponnese 7 months out of 12 and temperatures rise up to 30 degrees Celsius (and often higher - when we were there temperatures ranged from 30 to 38 in different parts of Peloponnese) so make sure you have sunscreen, a hat (it's windy at the bridge so make sure you keep it ON your head in some way) shorts and a T-shirt. Sneakers are a must - you'll need all the stability you can get while on the bridge. 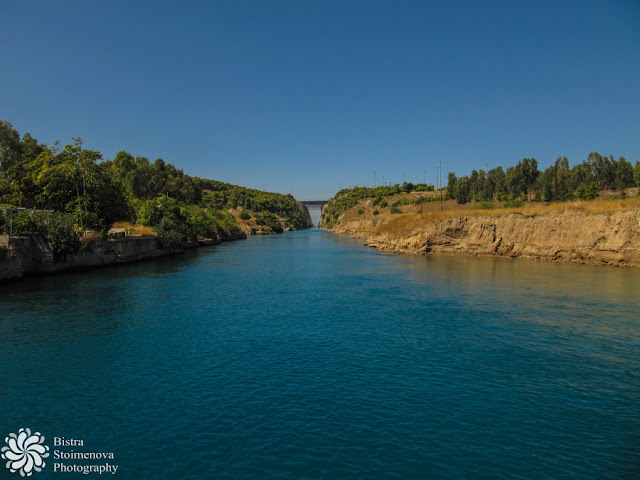 images shot in RAW (or the highest quality JPEG) - so you can use your files later on. lens - wide angle is a must - you don't have much space to move around either way. 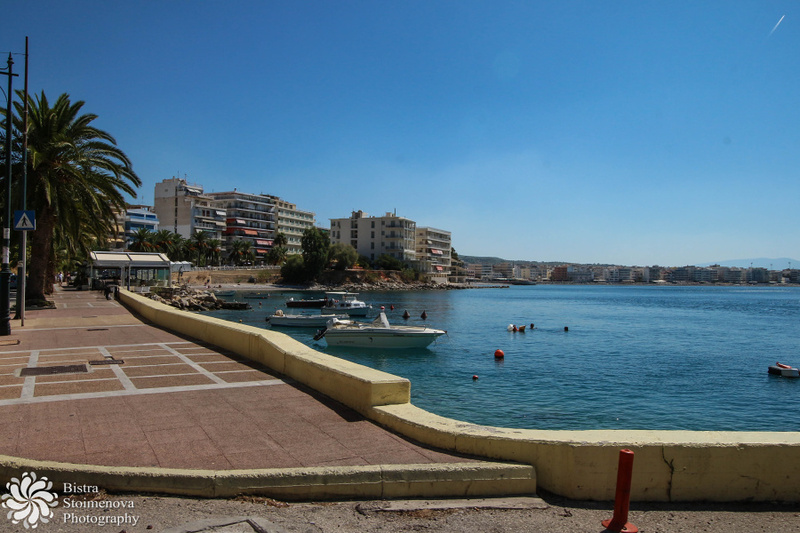 10-18 mm is a good choice but if you don't have one - use the widest setting of your lens (normally that is 18 mm). Forget about telephoto lenses unless you want to get a portrait of someone in the boat below. The railing of the bridge in detail. Do NOT hang over the railings!!! You don't want to risk a 70-meter fall down to the 8-meter deep water. 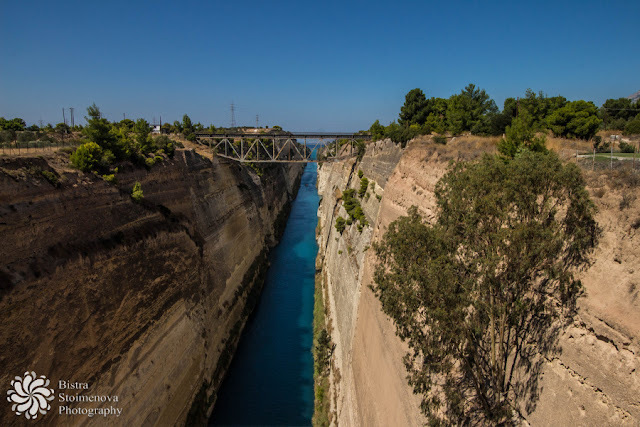 (I am myself afraid of heights and that one took my breath away but still...) If the other viewing platform is still closed (as it was when I was there) DO NOT TRY TO GET ON IT!!! If they closed it - they probably did it for a reason - probably it is not stable enough to host ANYONE. DO NOT play the hero! A side shot of the canal to show you ho deep it is. Last note - Corinth Canal is one of the most spectacular places I have been to. If you are in the area - do go there. It's worth it! Corinth has other places to see as well - Ancient Corinth is a must - see and has a great view and they have to have a museum or two. 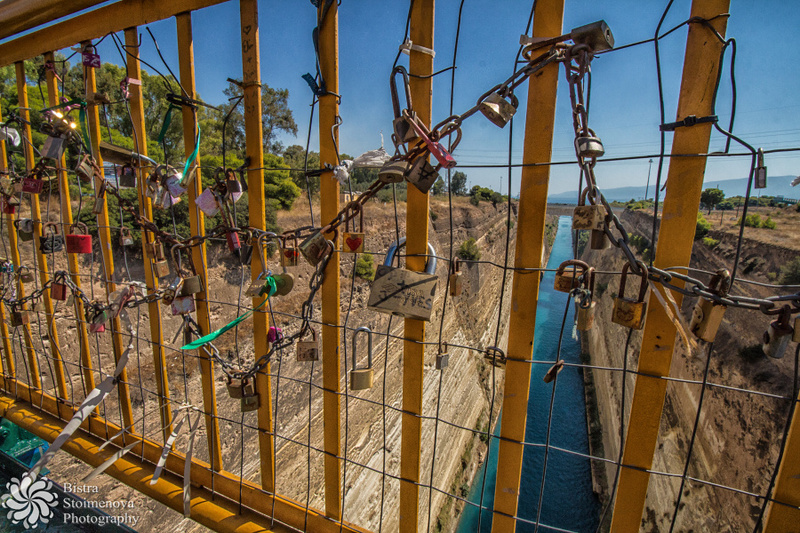 For those in love - bring a padlock and lock it on the bridge - many couples do that like they do it in France. As you can see from the picture above - they are quite a few. Posted by Bistra Stoimenova at 18:23 ч.